Some aberrometers calculated the Modulation Transfer Function which can be seen as objective contrast sensitivity. 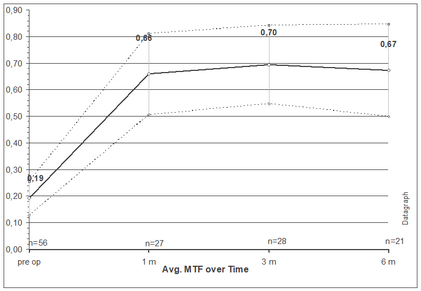 In order to calculate and graph average values over time, the 'area ratio' comparing the area (=integral) under the 'Total' or 'HO MTF' curve with a 'Best MTF' reference curve has to be provided by the aberrometer. See your aberrometer's users manual for details. Datagraph plots values entered on the aberrations tab in the MTF columns. 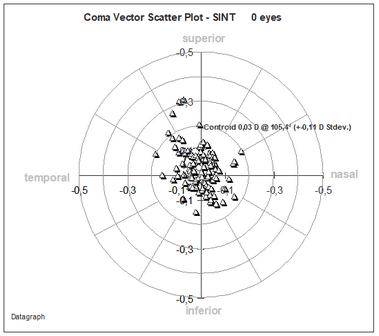 Either Total MTF (including residual refractive error components) or HO MTF curves can be made.